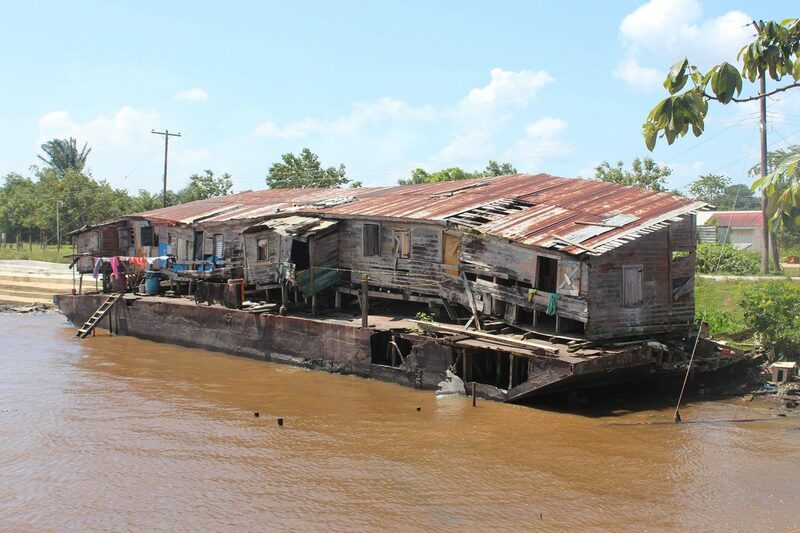 At first glance, the rickety dwelling looks as though it once rested comfortably on a bank of the Essequibo River. Now, due to its advanced state of decay, it appears to be slowly slipping into the water, although closer inspection reveals that the dilapidated structure is built on an old pontoon, which is moored on the riverbank. 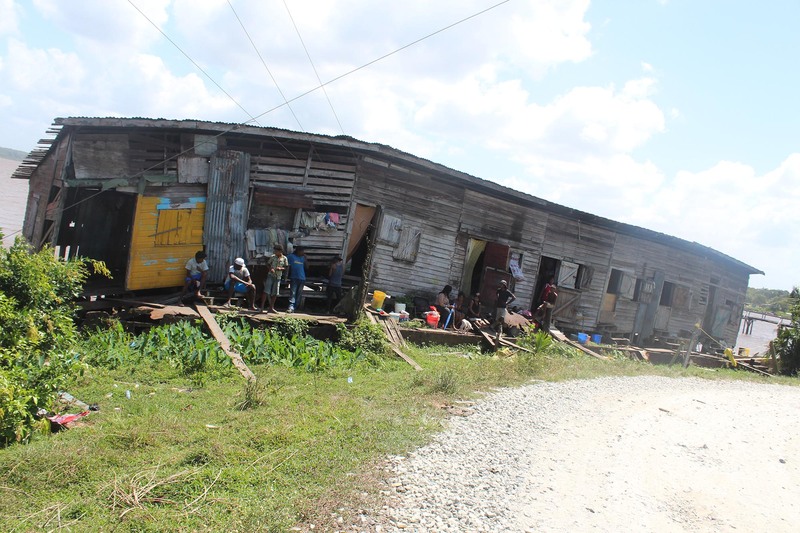 For at least 20 persons, the rapidly deteriorating structure in Byberabo, a community located less than five minutes from Bartica’s commercial district, is home. 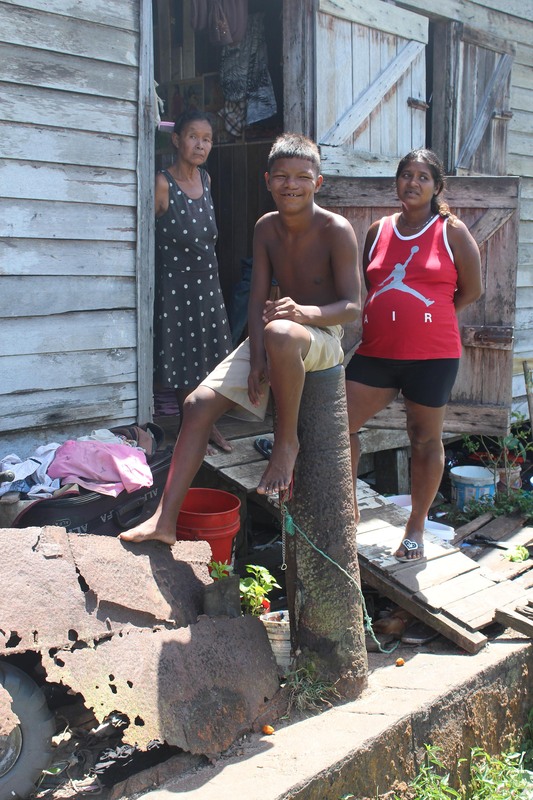 It is also a stark reminder of the daily struggle for “better” in the midst of the drive to create Guyana’s first ‘Green’ township. In its better days, the structure was used as accommodation for workers employed at a former nearby sawmill, Nagasar Sawh Ltd, which closed its doors several years ago. Based on what was seen during a recent visit to the area by Sunday Stabroek, the battered edifice houses seven “apartments,” measuring about ten square feet each, which are used by the families for both sleeping and cooking. And despite growing concern that the bottom of the pontoon will cave in at any moment, families continue to go and come. These include the McDonalds, now a family of 10 and at least six of them have been calling the structure at Byberabo home for the past two years or so. The matriarch, Pasty McDonald, in an interview with this newspaper, explained that she and her children, ranging in age from 14 years to 28 years, had relocated to Bartica from having previously lived on Kaow Island in the Willem’s Timber compound. The family took up residence a short distance away from a shingle factory where one of her son’s Lloydy McDonald was employed as a machine operator. However, after the factory ceased operations, the family eventually found its way to the ramshackle structure at Byberabo. Though she could not definitively say how long they have been living there, Pasty estimated that they have been there for at least two years. “When the people who use to live here when the sawmill break down gone, we come and move in here. They use to have nuff people who use to live here first, but people are always living here,” she shared. She noted that at one time she was employed as a domestic worker but has since resorted to spending the rest of her days at the structure at Byberabo, leaving occasionally to attend the clinic in the town. 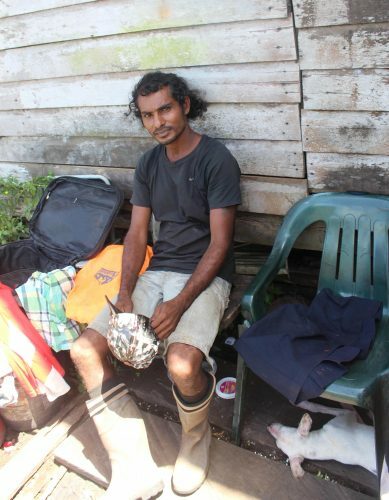 Her eldest son, Lloydy, and a younger brother, have since taken up the task of providing for the family through their employment at the regional office. According to Lloydy, he and his brother work Sunday to Sunday to support their dream of acquiring land to relocate the family. In the meantime, they continue to live humbly at Byberabo until better comes along. Considering the fact that the rusting pontoon sits on the bank of the Essequibo River, one could not help but think of the challenges faced during the occurrence of spring tide. However, it was noted that though the water rises to a considerable height, it has never risen high enough to get penetrate the living quarters. It was noted though that during times of heavy rainfall, it is often hard to sleep since water seeps through the holes in the roof, resulting in soaked mattresses. With almost no access to running water, the McDonald family as well as the other occupants on use the Essequibo River for most domestic tasks, including bathing and washing clothes. “We bathe by the river most of the time and we usually fetch water from someone up the road that we use to drink and cook,” Patsy explained. Even the heavily pregnant Sarika Tymon, a resident who occupies a room about three doors down from the McDonalds, takes to the riverside to bathe. Tymon, who is also a mother of four-year-old child, like the rest relocated to Byberabo about three years ago and is currently “killing time” as she awaits word on alternative accommodation. She noted that if that does not come through, she will probably relocate to Berbice, where she has relatives. Not surprisingly, the ‘Byberabo Apartments’ lack a proper kitchen area as well as modern toilet facilities. According to Patsy, while most people have a section of their rooms designated for cooking, there is also the option of using the fireside. And with the absence of modern toilet facilities, the 20 plus persons who occupy the shaky edifice share a latrine that stands across the road, surrounded by bush. Although members of the family did not complain much about their current living conditions, they shared their experiences as victims of regular home invasions during their time living there. 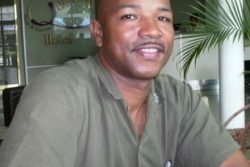 According to Lloydy, as much as his family tries to live in peace, they have on several occasions been confronted by persons who have attempted to disrupt it. This was corroborated by another young man who lives with the McDonalds and would have had his own experiences of that nature during the time he has lived on the water. “People does come in on we sometimes. It had a man come in we room and blow out we light and we end up waking up and they start beat he and he just run up the road. A next man had come in and try fuh burn down the house and we barely tek water and throw and out it,” the young man said. “We don’t do nobody nothing but they does just come and torment we suh,” he added. 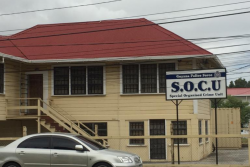 Sunday Stabroek was told that reports were made to the Bartica Police Station but no one has ever been held responsible for the acts. It was explained that a lot of time the intruders hide in sections of the pontoon. 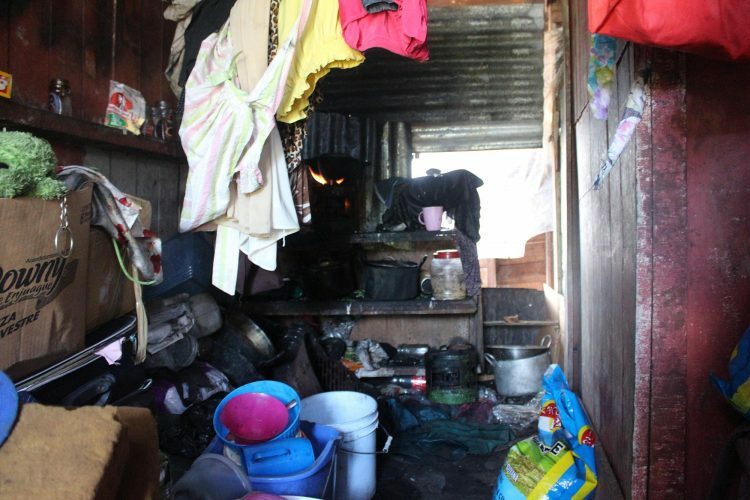 According to Lloydy, things have been so bad that at one time his 14-year-old sister, Jenita, was attacked by a man who had invaded the structure while they slept. This publication understands that while the alleged attacker is known to the family, no report was made to the police. “We always tell we-self that since we growing up we never pick trouble with people but people does want pick trouble with we and we does got to defend we-self sometimes. We don’t like problem budday, we does keep way from them things,” Lloydy said. Sunday Stabroek understands that this was partially one of the reasons for Jenita leaving school sometime last year. According to the teen, who was a second form student at the Bartica Secondary School, prior to dropping out, she felt as though she was an easy target for the students, and therefore often found herself in very confrontational situations. To avoid all of this, Jenita said she decided it was better to leave school all together. “We just deh easy here until I could get some land and move my family out. 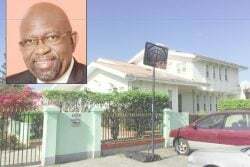 All we trying fuh do is get land and a house like so we could move out from here,” was the response given by Lloydy, when asked about the family’s future at Byderabo. According the man, he lost all his personal documents sometime last year while working in the backdam and he is now faced with the difficult task of replacing them before being able to apply for land. “My next brother that deh in the bush say he gon see if he get somewhere else for us when he come out back… nuff people does be saying that this place gone fall down on we and all kinda thing, and I does just get vex with them,” Jenita chimed in. 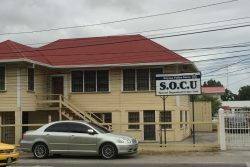 When asked if any attempts were made in the past to seek assistance from the Ministry of Social Protection, Lloydy indicated that they have always tried to do everything on their own. Nevertheless, he noted that once land is secured, he will make every effort to relocate his family.